Arkansas workers' compensation insurance provides certain types of compensation to workers who are injured on the job. 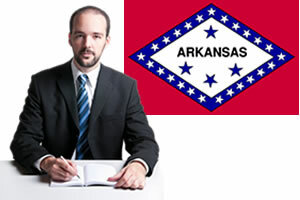 Workers' compensation law requires workers to forfeit their rights to sue their employers for compensation for their work related injury or occupational illness and in exchange the employer provides certain types of damages or compensation to the employee as defined by Arkansas workers' compensation law. The amount and types of compensation vary by state. There are some exceptions, but generally employers with four or more employees must provide workers' compensation coverage. Certain employers, such as domestic help or agricultural employees, may provide voluntary workers' compensation coverage. If you have been injured in a work-related accident you may be entitled to lost wage compensation and/or medical coverage to cover the reasonable and necessary medical expenses. Workers compensation is administered by the Arkansas Workers' Compensation Commission. Their primary goal is to "provide a fair, efficient, and professional public agency to serve the people of Arkansas by administering actions required or authorized by Arkansas workers' compensation law". Common injuries that must be covered by Arizona employers are injuries which ""arise out of and in the course of employment". Employees may not be covered if they were intoxicated at the time of the injury, if they intentionally injured themselves or if they were violating a company policy. Workers who fail to report their injury to their employer within a specified time period, who refuse medical treatment or who do not submit to a medical evaluation may also have their Arkansas workers' compensation benefits denied. Arkansas workers' compensation lawyers can help workers fight for fair compensation for their work-related injuries. If you have been injured from a workplace injury and have not applied for your workers' compensation benefits or if you think you have been unfairly denied, a workers' compensation lawyer from Arkansas can help you. Most lawyers will offer a free consultation to review your case and in most cases there will be no fees or cost until the workers' compensation case is settled in your favor. Arkansas workers injured on the job may be able to recover a variety of different types of benefits including: death benefits for surviving dependents, medical benefits, disability payments (if the worker is unable to return to full work duty) and vocational rehabilitation services. Death Benefits - Death benefits may be payable to a deceased workers surviving spouse or children. The amount of death benefit compensation is calculated based on the deceased worker's wages, up to a maximum allowed under Arkansas workers' compensation law. There is also a minimum supplied allowed under the law regardless of the worker's wages at the time of their death. Death benefits also include up to $6,000 in funeral expenses. Death benefits may cease if the spouse dies or remarries. Medical benefits - Arkansas workers injured in a work related injury or suffering from an occupational illness are entitled to paid medical care. Medical care includes all necessary care that is deemed "necessary and reasonable". Doctors are chosen by the employer but the employee may make one request to change physicians. Vocational Rehabilitation - Arkansas workers who have been injured in a work-related accident may be entitled to receive vocational rehabilitation. The goal of vocational rehabilitation is to help injured workers return to work. Services can vary and can be tailored to the needs of the worker but can include: counseling, job placement, and job training. If a worker is unable to return to their previous job, vocational rehabilitation is offered to find a more suitable place of employment. Temporary Partial Disability - Arkansas workers who return to work in a lighter capacity, but are unable to work their previous job at full capacity and are making less money as a result, may be entitled to temporary partial disability payments. Temporary partial disability payments are 66 2/3% of the difference between a worker's average weekly wage prior to the injury and their current average weekly wage after their injury. Temporary Total Disability Benefits (TTD) - Injured Arkansas workers who are unable after 7 calendar days to return to work due to their injury may be eligible to receive temporary total disability benefits. Payments for benefits are initiated on the 8th day of disability, and if the employee misses more than 14 total days they will be compensated for the first 7 days of missed work. Temporary total disability benefits are 66 2/3 of the employee's average, weekly wages (up to the state's maximum established rate). Payments can be made up to 450 weeks. Permanent Partial Disability Benefits (PPD) - Injured Arkansas workers who have been injured and are not able to return to their full work capability due to residual injuries or loss of function may receive permanent partial disability benefits or PPD. There are minimum and maximum payment amounts allowed under Arkansas workers' compensation laws and these amounts are based on the severity of the worker's injury and the number of weeks of compensation due to the employee. The percentage of the worker's wage paid is 66 2/3. Permanent Total Disability Benefits - Arkansas workers who are completely disabled and unable to work as defined under Arkansas workers' compensation law may be entitled to receive 66 2/3% of their average weekly wage or AWW (wages earned during the 52 weeks prior to the date of the injury) up to the state mandated maximum PTD amount. If you have been injured on the job contact your employer as soon as possible. All work injury reports should be made in writing and should include the date, time, nature and location of your injury. All states have a time limited for reporting work-related injuries. Failure to report your work injury prior to the statute of limitations may eliminate your rights to workers' compensation benefits. NOTICE ABOUT ATTORNEY ADVERTISING: This website is a pooled attorney advertisement. USWorkersComp.com is not a lawfirm or a lawyer referral service. Attorneys appearing on USWorkersComp.com have paid an advertising fee. Using USWorkersComp.com is not intended to and does not create an attorney-client relationship between a Subscriber Attorney and any Requestors. The information contained on USWorkersComp.com is not legal advice and the subscriber attorneys listed do not in any way constitute a referral or endorsement by this site. For more information please read the terms and conditions.